Enjoying a comfort similar to that at home while camping in the wilderness is what every camper dreams about. Being able to watch a TV to keep you updated on the daily happenings while out in the wild is just a plus. There should never be a complete disconnection between you and the rest of the world just because you are traveling in your RV. With your RV generator fully operational and providing all the power to operate your electronic gadgets in the wilderness, nothing is stopping you from enjoying the luxury similar to that you enjoy at home. Keeping yourself updated with everything happening all over the world, weather reports and even enjoying your fancied programs like football are only possible when you have the best RV TV antenna along with you. Only the crème de la crème of antennas can get you the signals of the best TV channels that you may need while at the campsite. Getting the best tv antenna for rv is somehow a tricky affair. You will, however, never get it wrong when you go through our comprehensive review articles before getting one. We have sieved through the currently available options in the market and narrowed down to four great ones that will make your RV camping experience second to none. There is no way you shouldn’t get entertained while on the road. As you can see, RV TV antennas are a bit costly. Therefore, you need to get your choice right from the word go. To get the product that you desire, it is very necessary to know the features to always look out for whenever you’re in the market for a new RV TV antenna. Generally, an RV TV antenna shouldn’t demand a lot when it comes to installation. The most versatile ones are often the most difficult to install. But you can always involve a professional to get the work done for you. The very best of antennas should allow for unobstructed and high placement for purposes of improved signal reception. There are also these portable types that you can just place on a tripod stand and still enjoy your favorite programs. The portable ones are not usually just limited to use in the RV alone. You can walk around with them and still watch your shows from whichever place you find yourself in. It is therefore important to check on the antenna’s installation type and decide on what will best work for you. Most satellite dishes are meant to be used while stationary. It is the only way through which they can acquire the necessary signals. But there are few exceptions like our top pick that can still be used in motion. You are likely to encounter too much interference while driving with most of these RV TV antennas. Are you in need of an in-motion or stationary RV TV antenna? Well, the choice is yours to make according to what you really need. How do you intend to use your antenna? Which channels are on your priority list? Do you want to connect to the satellite for subscription programs or you only need the free-to-air channels from the local broadcasters? These are some of the major questions that you need to ask yourself before deciding on the antenna that suits you. If you already have a package that you usually subscribe to at home, then just get an additional receiver and enjoy satellite viewing while traveling. The antenna you buy must be compatible with the receiver. Always check on the manufacturer’s list of compatible accessories. When it comes to local channels, just get the antenna to be within broadcasting tower range and away from trees, buildings and unclear weather for better signal reception accompanied with minimal interference. Of all the RV digital antenna reviews above, all can be used with two or more TVs. But it is the model and setup of the antenna that determines the number of TVs to be connected to the antenna. Some antennas can even connect to three satellites simultaneously while there are others that only connect to one satellite at any given time. The number of connected TVs is always the same to the number of receivers. It, therefore, means that if your antenna is only capable of connecting to one satellite at a time, then even if you connect multiple devices, the available program is only limited to what the operating satellite offers. A receiver per TV is what will allow you enjoy watching different channels at the same time if you are using a satellite dish. On the other hand, a signal splitter is required for TVs operating using OTA antenna. Apart from the channels that you want to watch, there are also other considerations that you will have to make before purchasing one. Some of these are mounting places for the antenna and the time that you will be using it. There are a variety of antennas that can either be permanently installed or temporarily placed. Some are also used when in stationary positions while others are used in motion. Do you want it indoors or outdoors? The choice is all yours to make on what you deem fit for your RV experience. But before you do that, note that outdoor antennas are very effective in terms of signal strength. On the other hand, it gives your RV unnecessary additional height that might prevent you from accessing certain areas such as underneath trees. Make sure that it can be lowered during your journey by road. You can raise it up once you have set base at a campsite. The indoor types can stay in the same position for a long time. There is no need to angle them in any direction for proper reception. The outdoor antennas provide better signal strength compared to the indoor antennas. High Definition (HD) antennas are a must if you want to view HD channels. An antenna booster is very necessary if you find yourself in an area that has weak signals. Without wasting much time, let us straight away get a detailed look at these products. We will consider their features, merits and demerits so that whenever you are in the market for the best RV TV antenna, you can always make a well-informed choice. Getting to the market with at least some knowledge of what to expect is very necessary. The Winegard RT2000T RV Satellite Antenna ranked as the best product in our list. It has several positive feedbacks from customers that have used it. 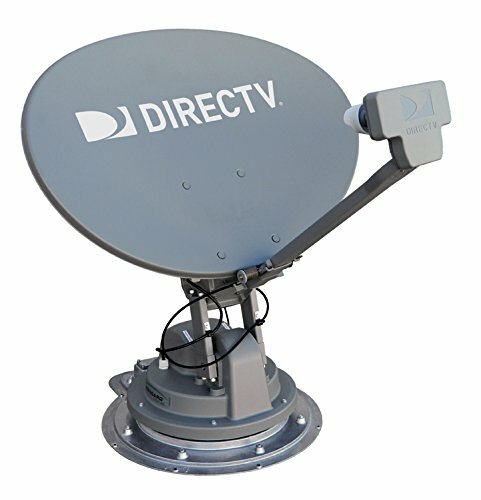 It is an in-motion satellite antenna which features a DISH, BellTV and DIRECTTV all in one. Have in mind that it is the only antenna that can be used in motion. You can enjoy all these programs while traveling in your RV. Its design is compact and a very sleek one. It is lightweight, smaller and quieter while in operation. It, therefore, requires the least amount of installation space on top of your RV. The smaller and lightweight it is, the minimal effort you will need to use in its installation. This antenna is easy to operate as just a single automatic button switches it both on and off. Its satellite acquisition is fast and accurate due to its DVB technology. It has a high signal strength due to its enhanced design that features a highly gloss and rounded dome shape. What’s more, this RV TV antenna model is available either in white or black colors. This antenna allows you to watch your favorite programs both in high definition (HD) and standard definition (SD). It is designed in a way that it allows for dual-tuner or two-receiver DVR usage. Winegard is a brand that has been on the market for decades when it comes to the production of RV TV antennas. Therefore, you can trust their products when it comes to performance. In the dual output operation, the antenna can only provide programs from a single satellite at any given time. This antenna is not only portable but also compatible with many receivers. The product weighs 10 pounds which qualifies it to be lightweight. It operates best at 101o and 119o for DIRECTV, 910 and 82o for BellTV and 110o, 1190 and 129o for the DISH. This product also has a 2-year warranty on parts and a one-year warranty on labor. Are you in need of a cheaper version of our top pick? Well, we still got you covered. The Winegard SK-1000 TRAV’LER antenna is what you need in any case you do not find our pick product in the market. With this antenna, be use never to miss everything that you can find on satellite TVs. And if you want to enjoy up to three satellites at the same time then here is your match. With this antenna, there is absolutely no difference between your satellite experience at home and in the RV. Being that it is a multi-satellite that can allow for connection of utmost three devices, it becomes so family friendly that every member of your family can enjoy their programs without interfering with each other. 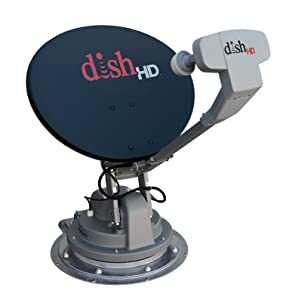 This antenna is capable of connecting to satellites at 110o, 119o and 1290 in DISH network. Additionally, 61.5o is manually available. It is also capable of acquiring Bell TV satellites at 91o and 820. Even if you happen to be in a group with more than one RV, you will still be in a position to enjoy your DISH viewing in HD. The antenna operates exclusively on DISH satellite receiver programming and technology. You can, therefore, enjoy it at home as well either in Pay-As-You-Go or monthly packages. Remember that the same brand manufactures this product as our top choice meaning that the two are very much reliable. It is, however, a bit heavier compared to our top choice product; it weighs 45 pounds. It is designed for use in a stationary position on the RV’s rooftop. Its base is stable therefore allowing for signal acquisition without interruption. An elevation of 5o on the roof is perfect for its installation. This antenna tows up to a height of 9.75 inches during travel. What’s more, it also comes at a relatively pocket-friendly price. We are living in tough economic times. That is a fact that cannot be assumed. If the economy is too tight on your bank accounts, then consider going for the cheapest yet highly performing RV antenna. And that is none other than KING Quest Satellite TV antenna. 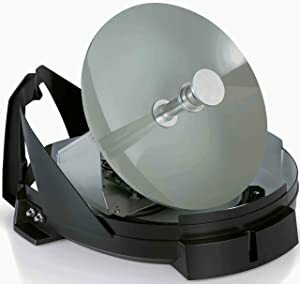 This product is very portable and can be used for DIRECTV service. However, note that it is compatible with SWM-only receivers. You can actually view your favorite programs with this antenna in SD, but there is an option for additional controller accessory which is bought separately. This additional controller is what you can thereafter use to make the antenna compatible with Bell TV and DISH HD. This antenna can either be mounted on the RV’s rooftop or better still used as a portable gadget. Mounting feet has been included to make its installation easy and quick. After you power the antenna using the already provided coaxial cable, it will self-aim and automatically lock in a direction where the signal strength is optimum. It doesn’t take long to get to this point. This antenna operates with DIRECTV H and HR receivers lower than H25 SD programming with receivers such as D10, D11, and D12. It also supports multiple TV viewing which is very necessary for families with different viewing needs. Even with the additional controller, only one satellite can communicate effectively with the antenna. The satellite communication happens at 101o. And it just weighs 8 pounds which makes it less demanding during installation because of how light it is. Have you been saving just to have the best RV TV antenna? If you have saved enough to the extent of considering a very expensive one with better performance, then Winegard SK-SWM3 antenna is what you can take home. The most expensive products are often loved by many due to their durability and well-advanced features. This antenna is designed with approved reflectors that ensure that there is always a strong signal in any kind of weather. The reflectors are approved, and there is absolutely no reason to be worried about their presence. It features among the few antennas that can automatically operate as DIRECTV in HD. Its multi-satellite viewing characteristic allows for maximum programming of DIRECTV satellite at any given time. You can also use it with DVRs. Just a single on/off button is what operates it making it a very simple task for any person. It can only be towed to heights of less than 10 inches making its use possible in a stationary position. This antenna receives all DIRECTV SD and HD programming from 99o, 101o and 103o satellites. Its compatibility with a majority of most DIRECTV receivers such as Genie is a very big plus for you. The unit weighs 53 pounds and it is recommended that you look for a professional to install it for you. Everything that is required for its installation is included in the purchase. What’s more, the manufacturer has backed it with warranties of 2 years and 1 year on parts and labor respectively. There is nothing as satisfying as traveling in an RV but still able to enjoy almost all the comfort that your home often offers. Why should you even miss the news and your favorite programs while out camping? Not when we can help. 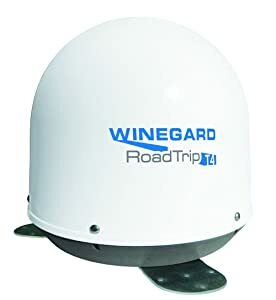 Of the RV TV antenna reviews, Winegard RT200T T4 RV Satellite Dish is the best tv antenna for camping. It the only antenna that can allow you watch your favorite programs while driving since it allows for in-motion operation. It is also relatively affordable. This product is also lightweight and compact. This means that it doesn’t require much effort for its installation. Installation space isn’t an issue when you have it. Besides, it is very easy to operate as just an on/off button is all you need to operationalize it. Its DVB technology is accurate and fast when it comes to signal acquisition. These are just among some of the reasons that make this antenna the best in this category. Don’t hesitate to get it for your upcoming trip. Do you have any questions or any additional information that we might have left out? You are free to communicate with us through the comment section. We’ll be very glad to hear from you.